CLICK IMAGE for how they died?? Heat!! The stone people are actually casts, the bodies were covered with a layer of ash and decayed within the shell that had been formed, leaving only the skeletons behind. Archaeologist Giuseppe Fiorelli realised that if plaster was poured into the mould thus formed you would get an exact cast of the body. The pyroclastic flow covered the bodies and hardened. When discovered, the excavators filled the (skeleton filled) body cavity with plaster. 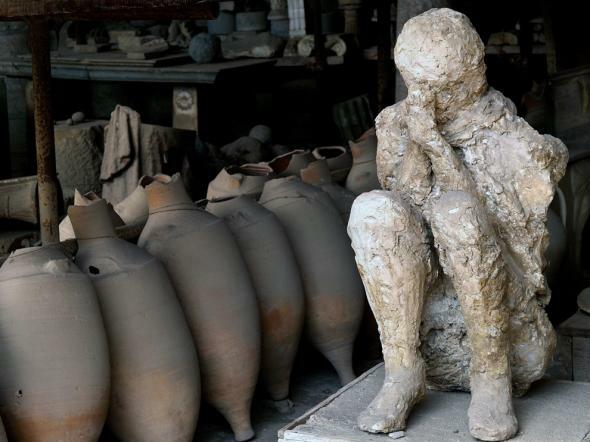 The resulting plaster form, when the pyroclastic flow was removed, left a replica of the body that had rotten away - this included impressions of their clothing, belts, shoes, hair, everything. Plaster was replaced with a substance that would survive the weather and whenever such a form was located the same procedure was used. So those "rock covered" people you saw were actual skeletons covered with a molding compound (cement?) that duplicates the body of the dead. They are called casts - there are casts of dogs as well. Giuseppe Fiorelli took charge of the excavations in 1863. During early excavations of the site, occasional voids in the ash layer had been found that contained human remains. It was Fiorelli who realized these were spaces left by the decomposed bodies and so devised the technique of injecting plasterinto them to recreate the forms of Vesuvius's victims. This technique is still in use today, with a clear resin now used instead of plaster because it is more durable, and does not destroy the bones, allowing further analysis.